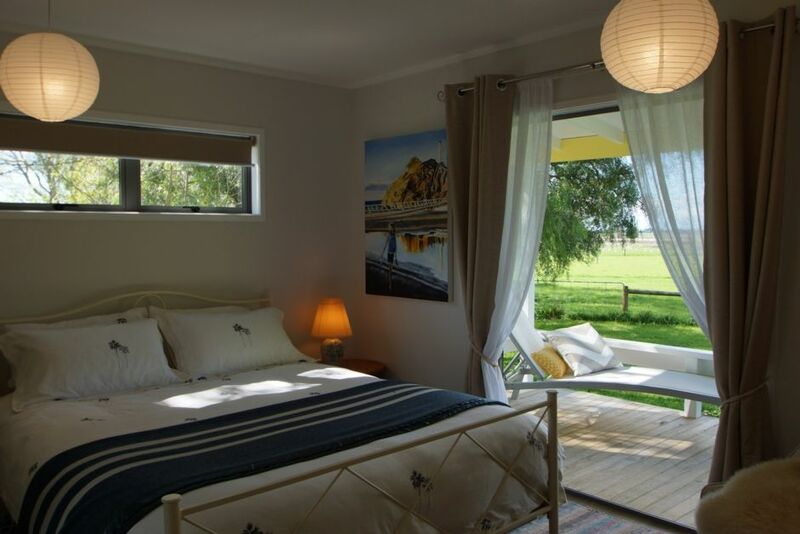 Cottage, 2 Bedrooms, 2 Bathrooms, (Sleeps 6) 2 Nights Stay Minimum. We are at the southern-most point of the Heretaunga Plains, the heart-land of award-winning wines and fruit-growing with expansive views north up the sun-drenched valley toward Havelock North. While olive groves and vineyards are nearby there are no orchards close or associated sprays. On a favored circuit for cyclist training, the flat terrain is the choice for cycle racing, motorbike touring and a local stage of the yearly national 'Targa Rally' (October) for road racing cars. However most days we are surrounded by gentle rural sounds of the Louisa Stream, birds and farm animals and our own hens and rooster. The stream next to the cottage is fenced to develop as nature reserve with new planting of native trees and plans to develop access to the swimming hole by the bridge. Its clear water is currently home to fresh-water crayfish 'Kura', Eel and small fish and supports pairs of Kingfisher and Blue-faced Heron and occasionally a breeding Morepork (native owl) family. Seasonal fruit for guests to pick include apples, plums, peaches and peach-cot and field mushrooms. While it is possible to bike to Havelock North in about 30 to 45 minutes, 10 minutes drive will give access to many wineries with wine tasting and fine food, the Village Press for superbly fresh olive oil, the many attractions of Havelock North Village cafes, restaurants and boutiques and the Information Center for help, advice and booking tours. Guests will be welcomed at the cottage by the host and provided with the key. Groups of 2 or 3 couples or families preferred. Please indicate child age when booking to enable appropriate bed or cot provision. Smoking is allowed outside, away from open doors or windows. Standard rate for is for 2 adults as a couple sharing a single bedroom and en suite. 2 single adults using both bedrooms, $110 per adult a night is the charge. Open valley rural views . Access to farm and stream wild area with supervision of children. Nearest village Havelock North is 9 kilometers or 5 miles away in the same valley. In grounds stream and many rivers. Heat pump in the lounge and two fan heaters for the two bedrooms. Not electric but a cloths rack for drying in the sun on the deck or in front of the heat pump in cold weather. Free parking on the property, not covered but secure down a long drive next to private dwellings. Space for 3 vehicles and/or a camper-van on the parking space and extra on grass if necessary . Wireless, not high speed for down loads. Internet access. For internet, not high speed or for downloads. French Press with plunger coffee grinds provided and sugar and milk. Salt, pepper, oil, and spreads (jam, honey, marmalade, Marmite, Vegemite) vinegar and farm eggs ( bantam hens). Butter, milk and toast bread in the fridge. Full dining set of crockery and cutlery for 8 people plus wine glasses and tumblers. Casserole and mixing bowel, pots, steamer and fry pan for microwave or oven/hob. Serving and cooking tools/dishes. Mostly adult reading, plus magazines . Covered veranda out of three sets of double door from two bedrooms and lounge. Has table and chairs for two and deckchair. One en-suite bathroom is fully equipped to NZ standards for access and use by guests with disabilities. This includes grab rails for toilet and shower, non-slip and wheelable wet area, shower seat, raised toilet seat and wheelchair accessible hand-basin. Access ramp provides wheelable entry from the parking area to the covered deck where double doors provide easy access through living area to bedroom and bathroom facilities. The cottage provides a rural view including sheep, chickens and wildlife as well as cropping and vineyard activities. So nicely presented in a lovely location. Loved the fresh eggs and muffins for breakfast. Rosalie, Thank you for treating the cottage with such care. I particularly appreciate the validation of the tea pot in the cottage by your use of it in making traditional loose-leaf tea. It has, along with your internet links, providing inspiration to make an equally traditional tea pot cosy for the minority (like both of us) who appreciate a good hot cup of tea. Bringing your own loose-leaf tea does solve the issue of the huge range of flavours available and individual tastes. However I intend to provide at least one loose-leaf tea option in the cupboard as I do coffee for the French Press. Love the inspiration you have provided. Lovely stay again, very comfortable and clean, the little extra's eggs, creamery milk and muffins were a lovely surprise. This little cottage is set in a great peaceful area with a few chooks and cockerels being the only sounds for miles around. We really enjoyed our stay and would definite;y recommend. Lovely hosts also who were available if needed. It was a real privilege to have such thoughtful and considerate guests for 5 nights....setting the washing going on leaving goes beyond expectation but is a lovely gesture. Great relaxing spot. Lovely views. Excellent host. Great guests to host, who showed remarkable adaptability and generosity given the unseasonably filthy weather spoiled their plans. Awesome place to relax but not to far away from all the lovely cafes and bars in Havelock North. Northala is a rural cottage with all modern amenities, including laundry washing and drying, private garden and parking and wide sunny views down the valley to the village of Havelock North 9km or 5 miles north. The village provides boutique shopping, cafes, pubs and restaurants, and bicycle hire to explore the extensive Cycle Trail or discover the many Winery experiences. Adjoining Te Mata Peak will provide a view over the whole of Hawkes Bay on a clear day. Look for the Information Center in the middle of Havelock North for a rich source of local attraction and activities in addition to our favorite places provided in the cottage.